Typically, in my state, I’ve learned that most plants go in the ground around Memorial Day weekend. This year I’ve been trying to get my raised beds ready. I’ve also thought of actually expanding my garden wider and also adding two different locations. I have an area in the back of my home that doesn’t get too much light. However, it would be perfect for Swiss chard. I would love to add a couple of plants there. I also have the side of my home that gets the most sunlight. I’ve been living in our home for about ten years and I’m still learning the best garden location to plant my garden. When I originally started with my vegetable garden. I only did container gardening and I would pretty much leave all of the plants on my deck. Since my garden is growing. Plans are changing. Below I will be sharing what I plan on growing this year in my garden. I was reading the May issue of Better Home & Garden and I fell in love with an article they have in regard to a couple in California and their garden. They had an archway which I would love to build. This year I don’t plan on planting strawberries unless I find the plants for a really great price. I did not harvest a lot last year from my plant. Also, thanks to a Facebook group I’m a part of in my state. I found out about a local plant sale for vegetables and I have 48 plants. I know, I know. I plan on canning most of my harvest and of course giving it away to friends and family. Do you have a vegetable or flower garden? The time to plant is now :) We actually planted about a month ago and our stuff is coming in nicely. Hope you get lots of great veggies this year. Nice! I wish I could grow things. I have a black thumb though. It starts off well, and then the plants just die on me. My Mom has all sorts of things in her garden though. 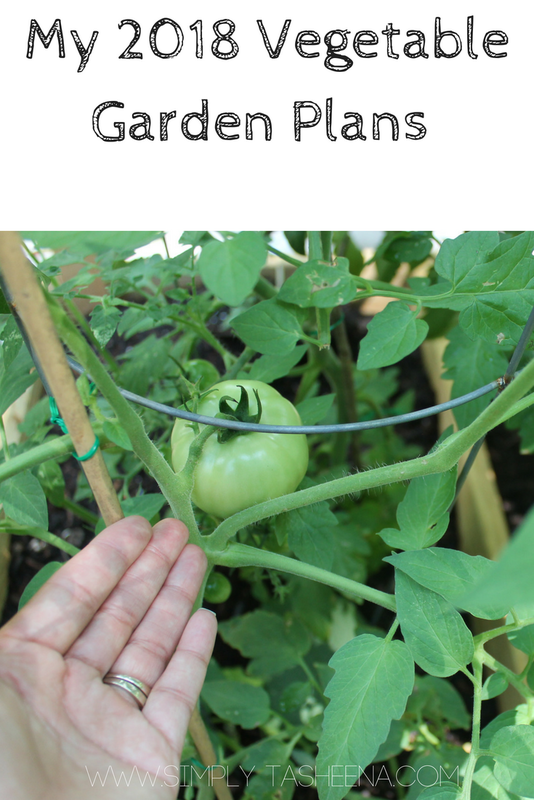 Your tomato plant looks awesome and so healthy. I need to get busy planting a few things. I sure do miss the huge garden my mom and dad always had when I was growing up. I started my seeds in February and we are still planting in our garden. I have three vegetables gardens and a herb garden. There is nothing like growing your own veg! I have to admit we don't have anything planted this year - our neighbour however grows lots and we often wake up to a bag on the back step. Homegrown is always best and who knows what they spray on our grocery veggies. A little bit of a challenge at this time of year where I live though. I love how you plant the tomatoes and peppers they must be amazing. I give you credit for attempting pumpkin which would be great too. What's a swisscard? I have have just started with my seedlings, I love fresh veggies in the summer. This vegetable garden is really a great idea. You get to have a more refreshing garden and can really save you a lot of money too. I have done cherry tomatoes in the past. Our weather and my schedule has been nutty this year so I don't have anything in. Where do you live? We are in Upstate NY and our season is very short. Also we plant garlic around the beginning of October. This year I think I am mostly planting lettuce, tomatoes, and onions. I was hoping to plant a garden this year, but I am not sure if it will come to fruition. We always had a garden when I was a kid. I didn't like working in it, but I liked the garden rewards! This reminds me of my Mama's hometown in the Philippines where they grow vegetables and fruits in their own backyard. It sounds a really nice hobby! I always say I’m going to plant a veggie garden but I don’t! Oops! Good luck with yours!! I have never gardened before and this year I took the plunge. I have purple carrots, corn, cantaloupe,Hot and sweet peppers, broccoli, strawberries, blueberries and a sting of herbs. Not let’s hope something grows! I need to get my garden going. It has just stopped being cold here though so I am not sure how this season will go. I love fresh vegetables and enjoy planting container gardens. I'll have to try some of your picks this year as well as the ones I have planned out. I only have a few started right now. It's so nice to have a plan like this for your garden especially since it's the perfect season to start. I'd love to have my own vegetable garden!